Ottawa’s spring season 2009 will live on thanks to the all new Google Maps’ Streetview feature, which recently launched for most major Canadian cities. Google Streetview offers a 360-degree view of city streets, as if you’re driving in a car. The really amazing thing about Google Streetview is the ubiquity. 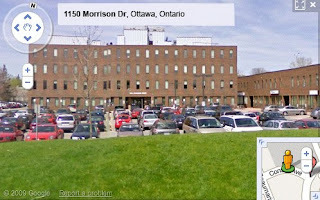 If you live downtown or in suburban Ottawa, chances are that a Google car drove down your street at one point over the past year and captured your home and surrounding neighborhood (such as the Marketing Breakthroughs office, pictured). Privacy concerns have been raised about Streetview, which has been in operation in major US cities and Europe since 2007. To combat these concerns, Google now blurs the faces of anyone visible in its Canadian Streetview images, as well as license plates. To access Streetview, just enter an address into Google Maps, and drag the little yellow peg-man onto the map. Then kiss your morning/afternoon/evening goodbye–because it’s really fun to play with.